Much chomping of the bit has been heard around Bath of late. Supporters of the Two Tunnels Greenway - tantalising walkers and cyclists with the prospect of a gently-graded southerly route into the city - are still waiting for excavators to lumber into view more than a year after their anticipated arrival. Political navel gazing and bureaucratic gloop have pushed the start date backwards faster than real time. It’s all been very frustrating. 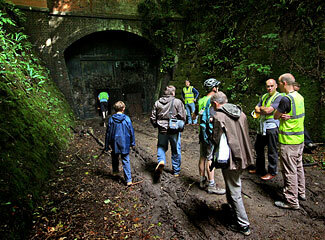 When it eventually takes the strain of foot and wheel, four miles of the Somerset & Dorset’s disused trackbed - including a substantial viaduct and two tunnels - will have been transformed into a ‘shared path’, offering users an alternative perspective to Bath’s customary picture-postcard views. 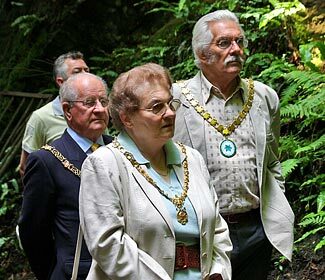 Largely traffic-free, it will seamlessly link a series of disconnected footpaths, entice more visitors into the city’s heart and boost the local economy, so say its advocates. The distant glow of torches from a guided group. Those powerful drivers have thawed the formerly cold feet of Bath and North East Somerset (BANES) Council which will play a vital role, letting the construction contracts. Its partner, Sustrans, has also stoked the fire with its recent appointment of a project manager. Survey work is underway on the route’s three significant structures - this should clear the path for BANES to soon assume ownership of them. A Memorandum of Understanding and contract are likely to be signed in the autumn. Momentum is slowly building even if nothing else is. Lending themselves to the venture are two single-bore tunnels. Devonshire, currently looked after by British Railways Board (Residuary), is buried beneath landfill at its northern end. 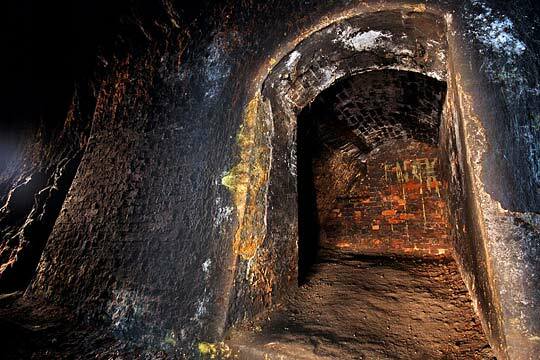 Exhumation of the portal is top of the to-do list and a heritage grant has been secured for this purpose. 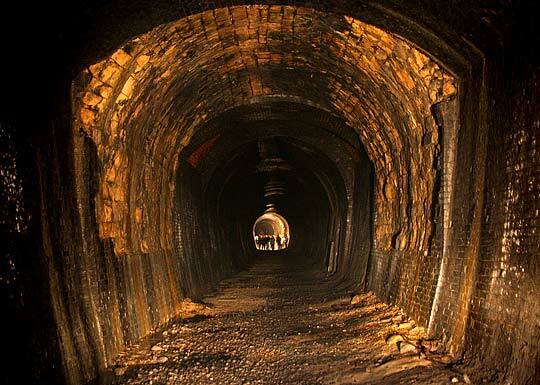 But at the southern end of tranquil Lyncombe Vale is the route’s honeypot attraction - the mile-long Combe Down Tunnel, the custodian of which is Wessex Water. 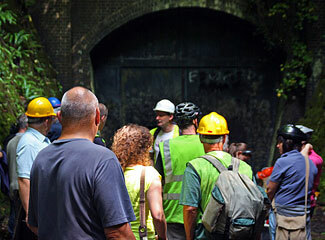 Whetting the appetite for its future liberation, the normally sealed tunnel had its doors flung open on 27th June, allowing around 500 members of the public to flow through. Enthusiasm was not dampened by the ballasted floor or lack of fixed illumination; members of the campaign group acted as guiding lights. With flip-flops on many feet and a hardhat edict duly observed, man and beast (yes, there were several reluctant mutts) seized the opportunity to find shade from the summer rays. 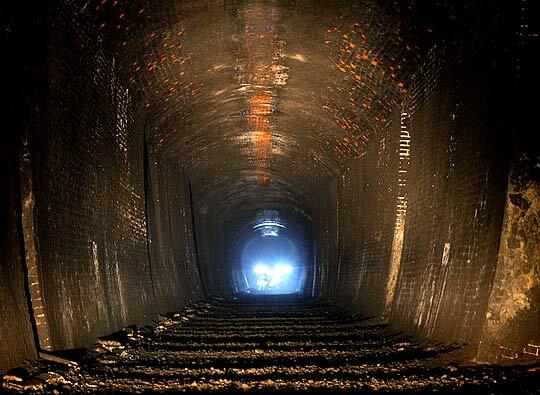 Opened in 1874, it’s a grand and quirky engineering feat, but blighted by the operational disadvantages of being the UK’s longest railway tunnel (1,829 yards) without intermediate ventilation. Smoke could wreak havoc on the footplate, occasionally causing those aboard to pass out. Towards the southern end of the tunnel is a platelayers' cabin. On a rising gradient of 1 in 100, trains plunged through the southern portal into a mostly brick-lined section with near-vertical side walls and an arch soffit springing off high haunches. Also encountered is left-hand curvature of 68 chains radius. Hugely out of place here is one short length of repair in sandstone. Changes in profile are frequent - the product of significant and recurring repair programmes. One such, authorised in 1907, involved estimated expenditure of £588. A platelayers’ cabin, cut into the eastern wall after 300 yards, must have proved a blessed refuge for those involved. Midford Sands give way to softer but self-supporting oolite as the tunnel straightens. 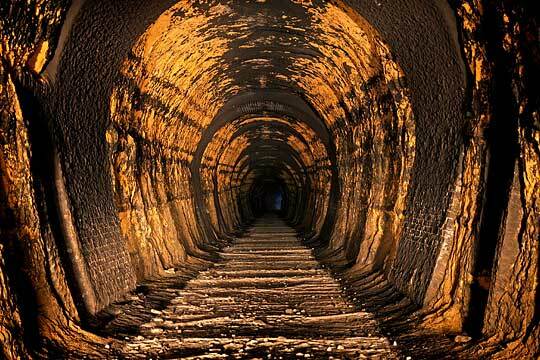 At a depth of up to 300 feet, this central section was completely unlined when commercial traffic first ventured into the darkness. Today it is supported by occasional collars of engineering brick. Around half the tunnel’s length is lined. 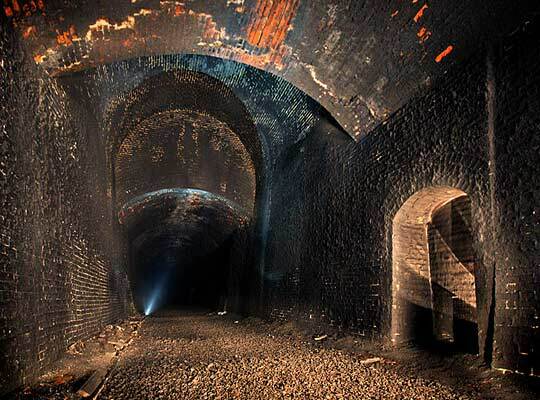 Looking south through the tunnel's central section which is unlined except for occasional collars of engineering brick. This section’s summit is reached 19 chains from the northern portal. A full lining resumes around this point. For 10 yards, a significant change in section sees the roof raised abruptly by several feet, presumably the result of a huge overbreak during construction. Light from the northern end is rapidly painted on the wall as a tighter left-hand curve (29 chains radius) reintroduces the traveller to fresh air. An abrupt change of section approaching the northern portal, presumably the result of a huge overbreak during construction. For most, this had been an intriguing one-off experience. But another recounted his childhood tale of an illicit excursion into Combe Down with his mates. Despite a surfeit of refuges, they pushed themselves against the wall and held their breath when fuming monsters screeched past them. Parental suspicion was heightened by sooty marks on one lad’s back - a schoolboy error - and reinforced by his companion’s vague explanation of their whereabouts. He did not describe the consequences for his backside. Bryan Chalker (right) with his fellow dignitaries. And there is light at the end of the cliché. ‘I’s and ‘T’s are being dotted and crossed, as council process demands. With full funding in place and the economic doldrums driving fierce competition between building firms, it is no longer the view that phased construction is the way forward. The fourth and final £100,000 tranche of council funding is due in the financial year 2011/12; by then it’s hoped that the £1.8 million project will be substantially finished, barring any oversized spanners being jemmied into the works. Contractors will provide Combe Down with a cycle-friendly surface together, quite possibly, with mobile phone coverage and lighting tied to motion detectors. LED technology - offering bat-friendly illumination without the heat - is emerging as an alternative to high-pressure sodium lamps. Innovation abounds. The project is firing imaginations and the open day served only to fuel them further. Impatience is giving way to anticipation. An approaching party of explorers. The campaign group's account of the open day. Another pictorial report on the day.